Patrick Geary is alarmed by the rapid progression of nationalist movements in Europe and the popular support such movements receive. Historians bear the brunt of his displeasure because they are responsible, in his mind, for the re-emergence of these divisive movements. The result of such nationalist tendencies, in Geary’s estimation, is a “deep crisis of identity" (3). 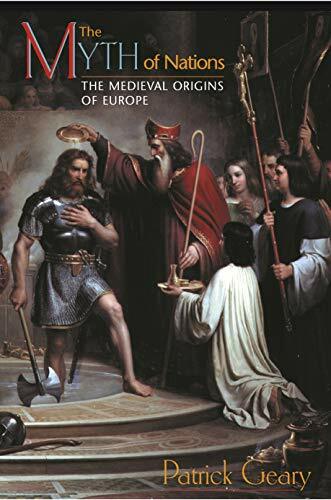 Early medievalists often find themselves at the center of an explosive issue because “no other period of history is as obscure and obscured by nationalist and chauvinist scholarship" (9). Geary is emphatic in his declarations that medieval scholarship made history available to ideologues to distort and bend to promote their own agendas. Though the error was inadvertent, Geary feels uniquely qualified to correct centuries of misguided history. In The Myth of Nations: The Medieval Origins of Europe, Geary argues that nationalism, as perceived by most people around the world, is a myth. Modern day Germans, Serbs, or any other “ethnic” people share nothing in common with their barbarian ancestors. Furthermore, such modern-day peoples have no right to land through “primary acquisition,” that is, have an original claim to lands that their ancestors acquired through conquest. Such claims to ancestral lands and legendary heroes are an attempt by ideologues to promote their own agendas for political reasons. At some points, Geary uses descriptive language to describe nationalist movements and modern nationalism as a “pseudo-science” and “invented” history. Modern scientific endeavors, like ethnoarchaeology and philology, aimed to reconstruct and link ethnic identity in the Migration Period to contemporary peoples, in Geary’s analysis, are a “pernicious” scandal that is creating history rather than providing a context for understanding history as it was. The thread that weaves through his book is a new conceptualization of ethnogenesis: peoples united and disbanded as a natural process. Barbarians longed to become Roman, and when the Roman Empire was little more than a distant memory, Romans (provincials who lived outside of the city of Rome) longed to become Franks. What mattered was that a person believed he was a Goth, Frank, Roman, etc. and adopted that culture’s customs as his own, according to Geary. Herodotus might be rightly labeled the Father of ethnography rather than history. He uses terms familiar in modern history: “people” and “race.” In his writings, peoples are shown to form, disappear, and re-emerge as different peoples across time. He was a distant commentator who respected the values and customs of individual peoples and tribes. This is a stark contrast to Roman ethnographers who neatly labeled and categorized peoples and tribes according to geography and language. Roman ethnographers were not sympathetic to the barbarians and had very fixed understandings of their evolution and status. Tacitus was the exception rather than the rule: he made a reasonable effort to gather as much information as he could concerning particular tribes, but even his efforts come up short. It was in the age of Roman ethnography that the construct of “us” and “them” emerged, according to Geary. Ammianus Marcellinus, a reliable eyewitness source, was privy to the many different tribes within the broader barbarian confederates, but even he failed to differentiate these unique characteristics in favor of broad generalizations for the sake of Roman clarity. Geary believes the suppression of individual barbarian identities was intentional by ethnographers in order to safeguard the position of the Romans as the only complex and noteworthy ethnic peoples. Traditional distinctions in the Roman Empire were between citizens and non-citizens. When universal citizenship was offered to barbarians, social distinctions replaced those of citizenship and barbarian identity would now merge with Rome. Regional loyalties are given special attention by Geary who writes, “They [Roman provincials] praised its beauty, its fertility, and its rivers and forests in their poetry. They sought their future in its markets and in public roles in its local senate or curia. They worshiped in its temples which were at once as universal as Rome and as local as the landscape that they loved (70).” Class, region, and religious identity bound peoples together but there was a movement that was threatening the old ways. Christianity was unusual at best to Romans who were suspicious of monotheism and identities were blurred in the 3rd and 4th centuries with “Christian barbarians” and “Roman pagans” (92). Geary stresses the creation and disappearance of barbarian tribes as a natural process throughout the early medieval period. Roman provincials began to connect with a past that centered on their city and region. Barbarian kings entered the dual role of both king and Roman commander. They began to formulate again a new identity for themselves through genealogical descent, religion, and legal traditions. For example, in Ostrogothic Italy common kinship was stressed to foster stronger bonds of unity. When their identity seemed concrete, Justinian’s reconquest destroyed the Vandals, Ostrogoths, and the senatorial families of the Roman Empire in one fell swoop. In the north, barbarian ethnogenesis followed a similar course. The Franks emphasized commonalities between themselves, who were a combination of various tribes, and their Roman neighbors to form a common identity. Gaul was full of old senatorial families who began to view themselves in a local lens, i.e., as Franks. They became indistinguishable from their Frankish neighbors speaking the same language and dressing in similar clothing. The term barbarian was no longer tenable as an ethnic label . . . it now referred to foreigners. A history professor specializing in European and World history, Christopher Berg's research and writing focuses on creating a "usable" past that meets the needs of an educated public in the 21st century. Geary, Patrick J. "The Myth of Nations: The Medieval Origins of Europe." Ancient History Encyclopedia. Last modified April 22, 2016. https://www.ancient.eu/review/127/. Geary, Patrick J. "The Myth of Nations: The Medieval Origins of Europe." Ancient History Encyclopedia. Ancient History Encyclopedia, 22 Apr 2016. Web. 23 Apr 2019.